Having been a more than a casual observer of the career progression of The Whiskey Syndicate over a number of years and having been fortunate to have seen them under the spotlights on many, many occasions. The news that they were to split was met with considerable howls of grief and much hand wringing, not only from me, but from music fans right across the heart of England. Along with the announcement of the split came the news of a farewell gig on home turf at The Slade Rooms, so all was well with the world; for one more night at least. This was to be a celebration of their musical career as a collective, and their way of saying Sayonara to the great and the good with whom they have stood shoulder to shoulder through the good times and the bad. Hitting the stage mere seconds after 7pm, and despite traffic holding up many punters on Wolverhampton’s near-legendary ring-road, Stone Broken are sure to have impressed those who were fortunate to get there early. These guys are straight from The Whiskey Syndicate mould; hard rocking, bluesy Southern-style rock, heavily melodic, riff laden and pig-bitingly good. A promising future lies ahead for these guys (and gal), Honest Andy’s Sure-Fire Bet is that you won’t be hearing the last of Stone Broken. My Great Affliction are another band that I have seen on a number of occasions, usually at smaller venues than The Slade Rooms, and whilst they are undoubtedly fine musicians, Ste Goughs gruff vocal can come across as a little intense at times. Tonight, however, was a revelation! With a big PA and a decent mix, Ste nailed it. Daz Wright’s thundering bass was brain-numbingly heavy, and Craig Horobin beat the skins like a man possessed. Excellent set, and worthy of the ticket price in itself. Liberty Lies have been flirting with the big-time for a while now, but are struggling to make the big step to the next level. Tonight should have been the perfect platform to showcase their collective talents, but it proved not to be. With their own man working as sound tech, they have no excuses for the poor quality of the sound tonight. Even when they were a guitar down due to technical issues, the second guitar was inaudible leaving Adam performing to only drum and bass. Add to that the complex arrangement of pretty much all of their recent output, the set tonight was messy and at times incoherent. That said I have seen Liberty Lies enough times to know how good they are, tonight however, was not their finest hour. The audience were already primed and ready when The Whiskey Syndicate took to the stage to rapturous applause. Tonight was a celebration of their ten year brotherhood, and featured a rock ‘n’ roll stroll through the songs that established them as one of the premier acts on the Midlands rock circuit, with a particular bent towards 2012’s Right Side of Crazy album. Add to this a high tempo medley of some of the cover versions they have featured ‘live’ over the years, and you have a heady, powerful mix of smoky, balls-out-and-slapping-you-round-the-face, hard-rock ‘n’ roll majesty. Each took a moment (or in Mikes case, half an hour) to share their thoughts on their band-mates, on their time in the US, and to give their own special thanks to people who have supported them along the way, and it’s fair to say that there were melon-sized lumps in throats on more than one instance. I have never seen a bad performance from these guys, and tonight was a stark reminder of just how good TWS really are. If nothing else, their legacy will be that they have set a benchmark against which all bands should be measured. Whilst it does leave a sadness that we won’t be seeing them again as a unit, we should be grateful that yet again the West Midlands produced another fine, fine band that could hold their own against the best of them. 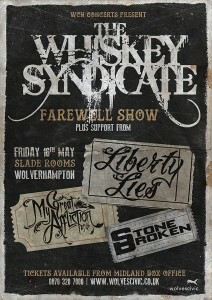 Wolverhampton is a darker, if not quieter place without The Whiskey Syndicate. Rich, Ant, Stu, Mike – we salute you. Interesting thoughts. Agree with your thoughts on Stone Broken. Didn’t “get” MGA at all. Don’t know why; possibly for the reasons that you did! I became a Lies fan after I saw them support Slam Cartel last year and agree that for the first half nothing gelled. Timing was out for all of them on the first four songs by quite a way with the result that it did sound dire. Things picked up for the second half but equally I’ve seen them play better and made that point to Adam S after the show. We’ll see how they perform with new management and back here in a few months. As for TWS: never even heard of them until a few weeks before the gig! How can this be? Poor management or publicity over the years? Shame, I thought that they did a great job, hopefully they might reconsider.